Lots of balls in the air right now, as it were. Custom re-work of a NOS Desert Storm-era fishtail parka. Re-fitting the entire coat, as it was designed as an over-over-coat, and that’s not my intended use. Backpack V2.0 needs attention. Fabric choices, paints (yes, paints), hardware, etc all to be picked- but progress! Roof top fly rod tube- for transporting multiple fly fishing rods. Finalized hardware today, started amassing parts and paints for the build. Not a complicated thing, but the paint job is non-trivial. Pictures will follow. Just finished a small “impossible artifact”- it’s a ceramic set of “brass” knuckles made as if NASA during the Apollo era might have spec’d such a thing. Sort-of. They were a fidgety thing to make- air drying clay is fickle, and free-handing a red worm NASA logo as an embossed thing into the clay? Yeah. Again: pics to follow. Custom macro keypad (as mentioned in the previous post). I’ve got the key layout done, the keyplate bought (but not cut…), and I’m making progress on the enclosure. Some hardware sourced, some decisions still to be made. New camera storage unit is built- needs some tidying of wires and whatnot, but it’s holding all the cameras and looking good. Project Xserve is complete- it’s up and running 10.11.4 with no problems, it’s got a new video card and a USB 3.0 card (with a separate controller for each port), and tons of storage. Odds and ends to come, I’m sure, but for now: done. My 1970’s KLH speaker overhaul drags on- turns out making wooden ring spacers is tricky. I’ve not given up yet, though. Annnnddd that’s it for now. Plenty of other things, but those can all wait until next time. The obsession with mechanical keyboards that I seem to have developed is… troubling. To the degree that I’m thinking about building a macro-specific keypad for a number of the repetitive tasks that I handle on a regular basis. 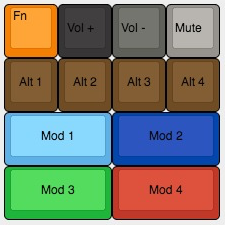 So, for example, one layer of this keypad would make the Mod 3 and Mod 4 keys the Edit In and Edit Out commands in FCPX, with the Mod 1 and Mod 2 maybe triggering transitions or media imports. Alt 1 would be to show video scopes, and so on. Then, with another layer, Mod 3 and Mod 4 would become Cut and Paste (in a single key press), with other keys (maybe) being mapped to insert small batches of heavily used HTML. Or something. Regardless, I’m figuring out parts lists and where to order key caps and switches and whatnot. AND how to get a Teensy 2.0 to act like a keyboard and handle all the macros and whatnot. All doable, mind you.